Over the weekend, while we were doing food hunting around USJ area we also visited one of property development that emphasizes on healthy living. 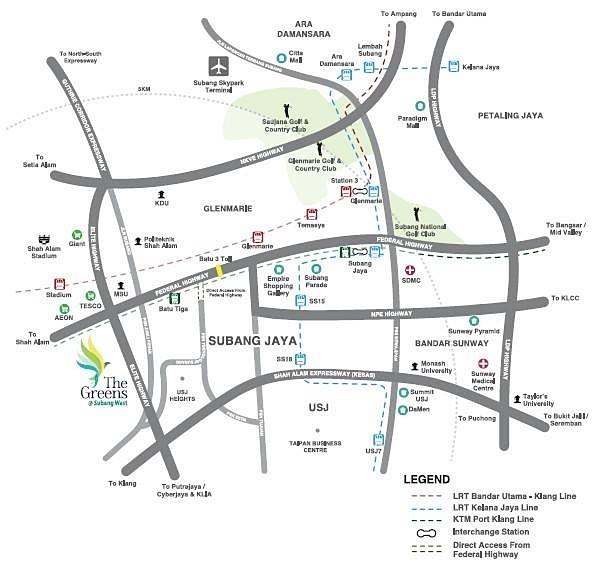 The Greens @ Subang West is 3.5km to Empire Subang and an extension of USJ, that offer the conveniences, amenities and more space within home and the development. Let’s take a tour and get to know how you can win awesome prizes via their Two-Riffic Bonanza. 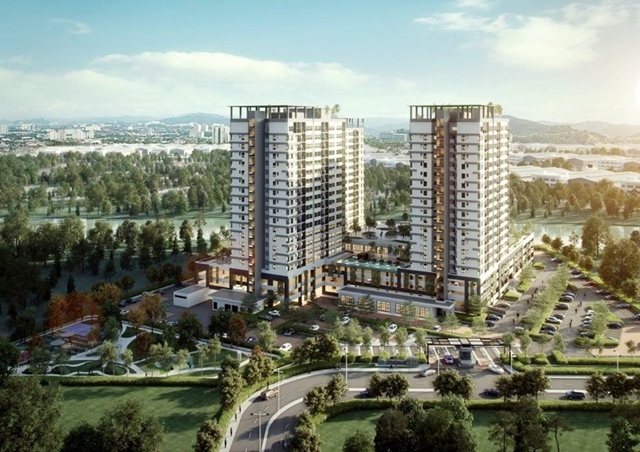 In the nutshell, The Greens is a freehold residential development comprising of 646 units of condominiums developed on a 7-acre land; a sustainable upper middle class condominium development located in Subang West, Subang Jaya much sought-after residential districts. It has excellent connectivity via major highways such as Federal Highway, KESAS, NKVE, ELITE, NPE and LDP; including public transport such as KTM station and upcoming LRT stations as well as Bus Rapid Transit (BRT) system. 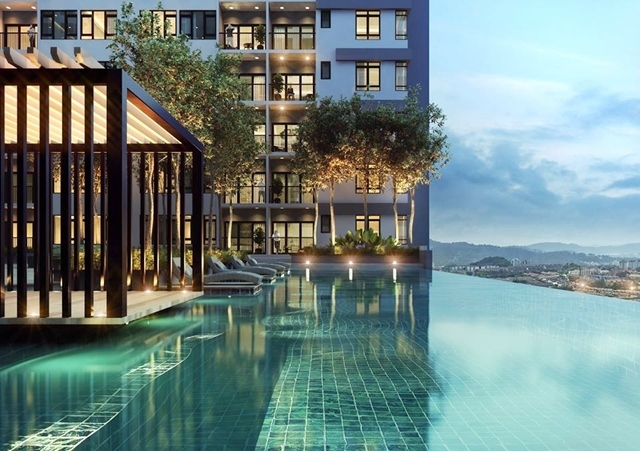 Cool right… now you know that The Greens is only 5KM from Subang Parade, 3KM from Shah Alam AEON Mall, near to so many amenities and also colleges such as MSU, KDU, INTI and SEGI. As mentioned the development emphasizes on healthy, safe and secure living environment, the developer has fitted over 45 facilities in that project such as Half Basketball Court, Indoor and Outdoor Gymnasium, Reflexology Walkway, Yoga Deck, Infinity Pool, BBQ Terrace, Social Lounge, and many more. I am sure you will be asking how many square feet per unit and how much right? Well, The Greens @ Subang West condominium units are available in 8 different types of layouts from 3 bedrooms, terrace units and penthouse with built up ranging from 915 square feet to 1830 square feet. Prices start from RM568,800 upwards and the expected completion date for the development is June 2018. Oh yes! Here is another good news for you, The Greens @ Subang West is running their Two-Riffic Bonanza which is a Monthly Lucky Draw campaign held every month from February to May 2017 and 1 Grand Prize to be held in June 2017. The grand prizes include Honda Jazz, Mac Book, and iPad as for the Monthly Draw prizes are iPhone 7 and mysterious prizes. Yes!!! You stand a chance to win TWO lucky draw prizes when you own a unit at the Greens. You might be the one who will drive home the Honda Jazz or walk away with the terrific prizes. Owning a home has never been so rewarding before. 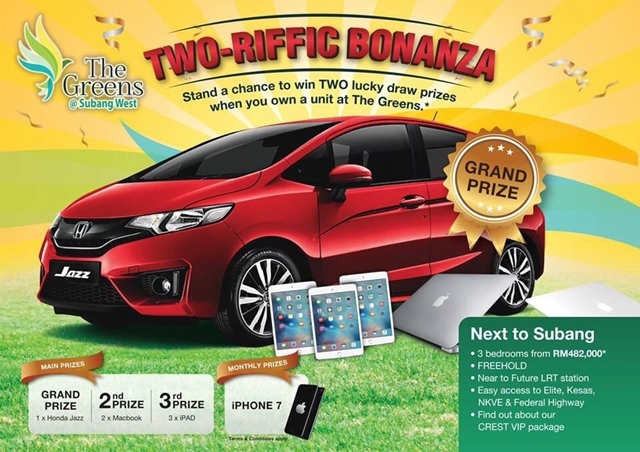 For more information about The Greens @ Subang West Two-Riffic Bonanza Lucky Draw Campaign, please visit The Greens @ Subang West Facebook, Website or call them at 03-50366060 for more details. Nice condominium, the Location is charming. nice. would love to check out the property! seems like a good property in a good location! Love the interior of the condo. Will check it out if I have time. Is a strategic place to stay but also a jam place. Nice design and will checkout on it. looks like a really nice place!! good to consider! The surrounding area was so calm and love the park and tree around!! Definitely a good deal and place to stay in!